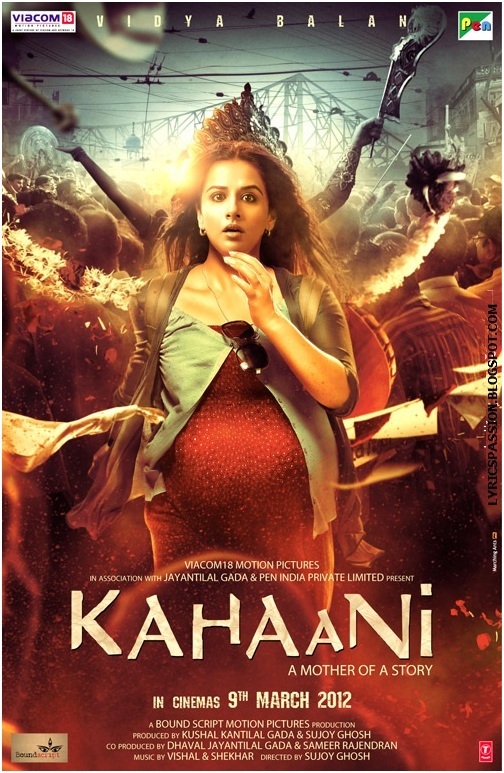 ‘Kahaani’ means ‘story’ in its Hindi literal translation. The movie is the narrative about Vidya Bagchi (Vidya Balan), a 7 month pregnant married woman who comes to Kolkata in search of her missing husband, Arnab Bagchi. She claims to have spoken to her husband when he had arrived in Kolkata, who stopped calling after a while, which led to her arrival. Upon inquiring about her husband’s whereabouts, everyone around her denies knowing him.Yet she is certain that he was in town. Although she is turned down by many, Inspector Rana, a junior officer at the Kalighat Police Station, is the only person she can turn to for help and who goes out of the way to help her. The movie’s plot is well written and even well-directed by Sujoy Ghosh. Vidya Balan has done justice yet again to her role, and proved to be an extremely talented actress. Her strong character and determination to find her husband, will grasp the attention of the audience till the end. Though Bagchi is 7 months pregnant, it demonstrates her will power to go through any difficulties and dangerous paths in order to find her husband. The music is composed by Vishal – Shekhar. The songs provide added attention to the movie that suits the situation the lead character is in.‘AamiShottiBolchi’ which means ‘I’m saying the truth’ in Bengali, depicts how everyone tells Vidya the truth, yet she finds it difficult to believe and continues the search for her husband. This opening song by UshaUthup is an apt song to showcase the situation of Vidya as she arrives in Kolkata. ‘EklaChalo Re’ which means ‘If no one responds to your call, then go your own way alone’ in Bengali, is a song written by Rabindranath Tagore. The song is sung by Amitabh Bachchan in the end, this showing how Vidya finds her own way out to find her missing husband. The background music which is heard occasionally is calm and soothing and gives one the feel of the situation. Kahaani focuses on the determination of a woman. The movie depicts their strength and the capabilities they have within themselves to overcome any hurdles that come their way. Vidya Balan through her role of Vidya Bagchi portrays the strong will a woman should have within herself and not let any obstaclebring down their self confidence. Another important aspect seen throughout the movie is the manner in which Vidya Balan finds her own way, no matter the number of complications she had to face. Women oriented movies such as Kahaani should be executed more, as it helps provide a change in perceptions in relation to them and break all the usual stereotypes. This journey of a woman in search of her husband takes the audience through the various secrets involved in his disappearance and unravels thehidden truths.It will keep the audience gripped onto their chairs till the end, wanting to know where her husband might be and what might have happened to him. A strong storyline with actors who have done justice to their roles, and an equally excellent music to support, Kahaani is a must watch movie and will be enjoyed by everyone.